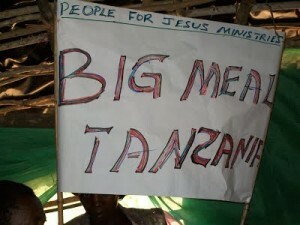 The BIG meal is a project of Mission International. Mission International’s BIG meal feeds thousands of needy children in the developing world on Christmas day. It costs £3.00 to provide a special meal for a child giving them a most special Christmas. For many children around the world Christmas can be the most exciting time of the year, they can’t wait to see what has arrived for them on Christmas morning, however there are so many more for whom Christmas day is much the same as every other day of the year. Hunger and grinding poverty make their Christmas day one that they would rather forget. The BIG Meal provides a meal on Christmas Day for needy children in the developing world in an attempt to make their Christmas day one that they can happily remember. Why support the BIG meal? In supporting the BIG meal you are making a huge difference to the lives of children in the developing world. The message of love which reaches the heart of a child when they receive a precious life sustaining gift, like a special meal, is very powerful. The meal communicates that somebody actually cares, that they are not forgotten, that out there somewhere are caring individuals who are seeking the best for them. The BIG meal is nourishing, filling and tasty. 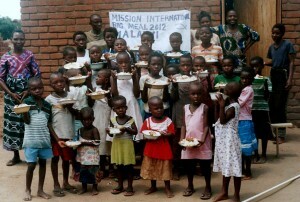 The children receive meat too as part of their meal, which for them is very special. The food is followed by a drink of fizzy soda which for them is so special since they are unlikely to have this kind of drink due to the cost. Children are also treated to hearing the Christmas story; a very special rendition by a story teller or in the form of a Nativity play. Your donation, whether for one child or more, will make all the difference in the world for those who celebrate a very special Christmas due to the BIG meal. A number of other locations are asking for the BIG meal to come to their community, however we don’t yet have the resources to roll the BIG meal out any further at present. Raising funds for the BIG meal in your locality would help us to share the BIG meal with more and more needy children on Christmas day every year. If you would like to raise funds for the BIG meal, please get in touch with us. Click on the ‘Give’ page under ‘Get involved’.